New business creation in China is outpacing the rest of the world despite its economic slowdown, with the number of new businesses created last year nearly doubling (up by 98%) compared to 2010, shows a new study by UHY, the international accounting and consultancy network. The research revealed that the number of new companies created in China in 2014 was nearly double the number created in 2010, increasing from 811,100 to 1,609,700 per year. According to UHY, new business creation is accelerating more quickly in the UK than in any of its Western rivals, with the number of newly established businesses in the UK increasing from 385,741 to 581,173 per year. Third in the study was India, which saw a 46% increase in the number of start-ups. 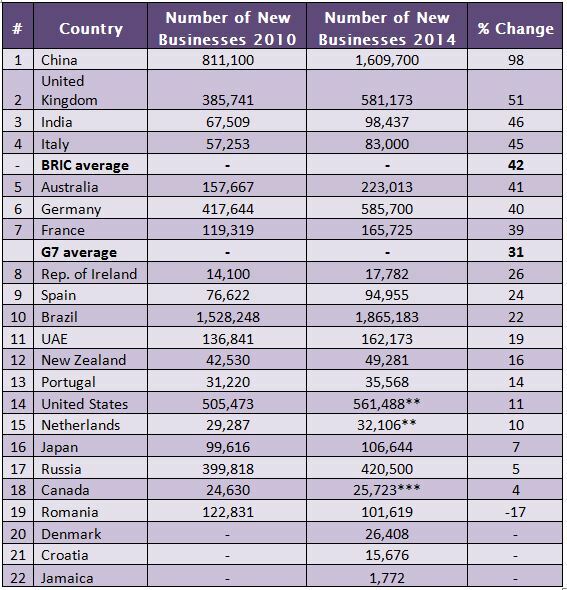 The BRIC economies averaged a 42% increase in the number of new businesses created over the same period. UHY’s study shows that the Western European economies tended to see a bigger increase in the number of new business ‘births’ compared to other developed economies. The UK, Italy, Germany, and France had increases in the number of new businesses higher than the G7 average of 31%. By contrast the increase in new business creation over the period was 11% in the USA, 7% in Japan and 4% in Canada. Australia also beat the G7 average, with a 41% increase in the number of new businesses created. UHY explains that the severity of the financial crisis and recession in many European countries prompted governments to take significant steps to encourage business creation. Common measures included changes designed to reduce the amount of tax due from start-ups and small companies, and to simplify the bureaucratic burden. For example, Italy has significantly simplified the procedure for establishing new companies, so that it is now possible to establish a company with one euro of share capital. In Spain, steps have been taken to simplify the tax system and improve the online system for tax returns, reducing the administrative burden on small businesses. The reduction of the corporate income tax rate for new companies has also encouraged investment in businesses in Spain. Many countries have also experienced an explosion of alternative finance providers, which has helped improve start-ups’ access to finance. It is estimated that non-bank funding now accounts for 30% of finance provided to companies across Europe. * An estimated Euros 3 billion of European non-bank funding now takes the form of peer-to-peer lending, crowd-funding and other new models.